1. To make the ginger garlic paste, mash the ginger and garlic together with the back of a spoon or a food processor until it becomes creamy. Add a pinch of salt, and mix together. 2. Wash wings and place them in a pot or large bowl. Add lemon juice, chili pepper, onion, and ginger garlic paste. Mix together, use your hands and get all the wings coated. Let marinate for a minimum of 2 hours. 3. While the wings are marinating, put all of the ingredients for the wing sauce in a sauce pan and simmer for 5 minutes or until butter is melted. Remove from heat. Put a lid on it, and set aside until needed. 4. After the wings have marinated for 2 hours, heat oil to 375 degrees. Remove wings from marinade and tuck wing tip. Coat wings in bread crumb mixture and deep fry for 7 to 10 minutes (until golden brown). Remove from oil and let drip on a wire rack (if you put the wings on paper towels they will get soggy). 5. Dip each wing in wing sauce, coating it well. Place in baking pan and bake at 350 degrees for approximately 15 to 20 minutes. 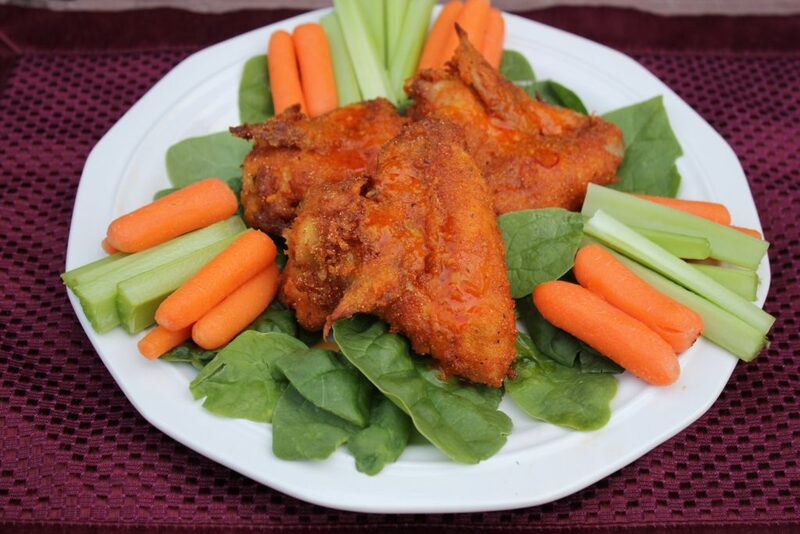 Remove from oven and pour remaining wing sauce over wings and serve.